Tonight the Art with Heart team are sharing creative Easter creations. Don’t forget, sale-a-bration has just over a week left to earn free product with purchase or it is also a fabulous time to join Stampin’ Up! Ask any of the girls on the hop for more details. 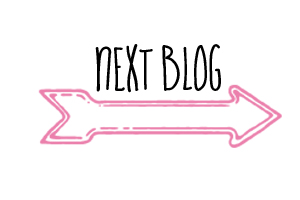 You have come from the lovely Judy May Blog hops are full circles, so you can start hopping here and then at the end of each post is a link to the next one. There is also a list of participants at the end in case of any broken lines. I have made 2 projects for you this month, the first one is an Easter card using the Sweet Little Something stamp set, just love this little guy. The card stock is Flirty Flamingo, for the mat I used Painted with Love DSP. I stamped the rabbit with Powder Pink, Blushing Bride and Flirty Flamingo on Whisper White card stock and trimmed it to a banner shape, I also cut out 2 little banners using Gold & Dazzling Diamond Glimmer paper, added a bow with 1/4' Calypso Coral ribbon, this is a nice and easy card to do but effective as the gorgeous paper does most of the work for you. On the inside I used the 2 little flower stamps in this set and stamped a border on the side. tear tape. The little rabbit is from the $2 shop you get 3 in a box. The bunny certainly makes a cute card. 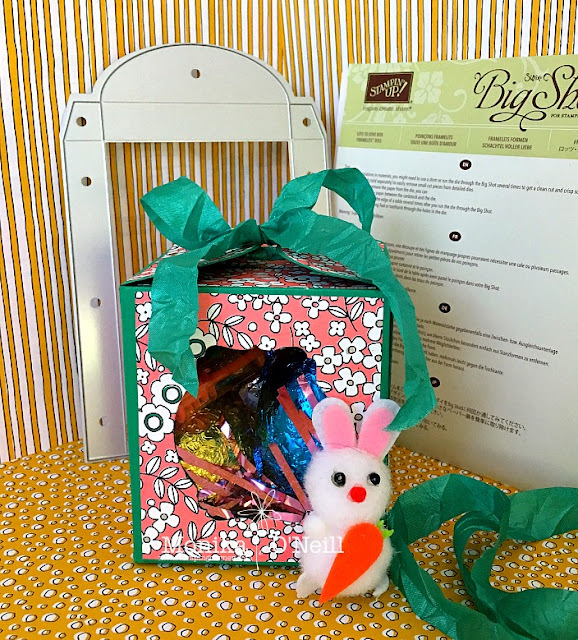 Thanks for joining the Easter blog hop. Great projects Mon, I love the bunny. 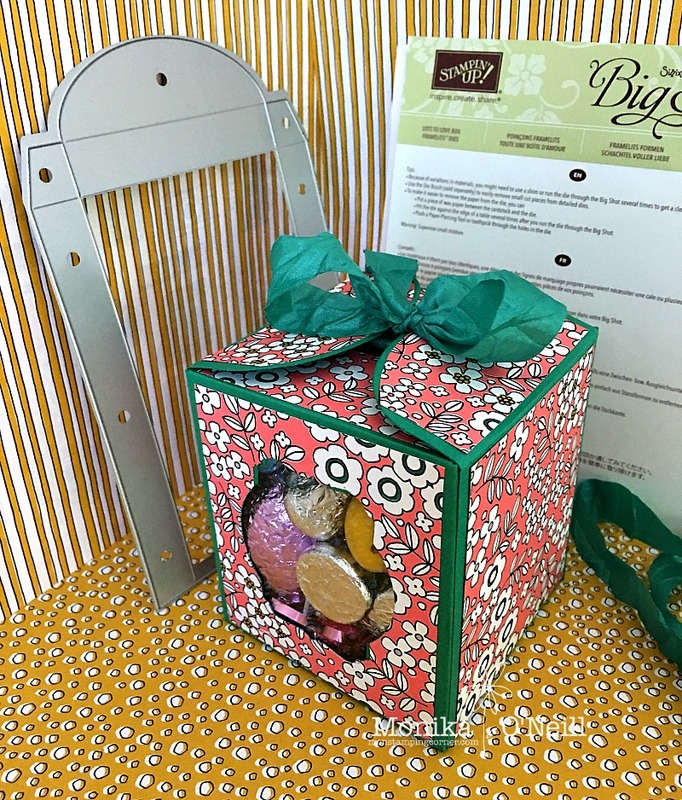 What a great box too for all the Easter Eggs. Mon I just love your box, and your rabbit looks lovely stamped in those colours against that pink DSP. Now I wish I had of bought the lots of love box framelit. I just love your Easter box! I love the teddy card. 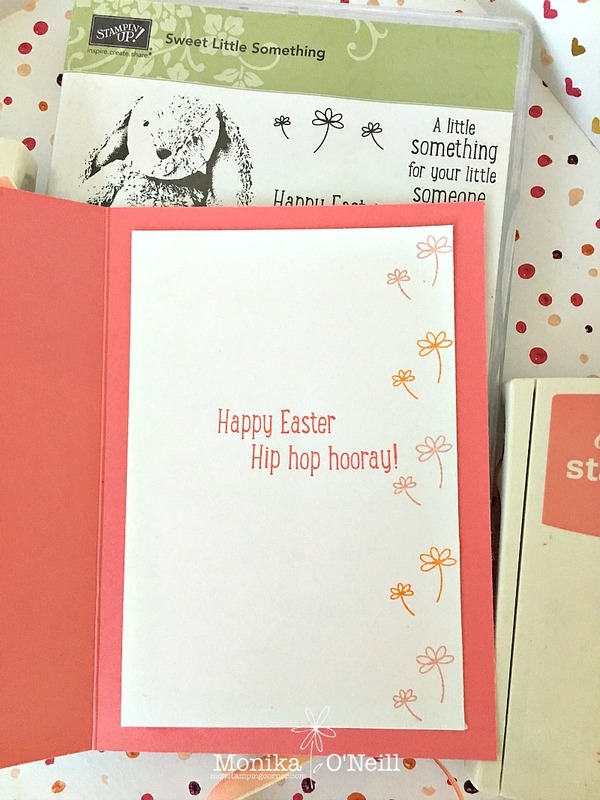 It is a great card for for Easter. 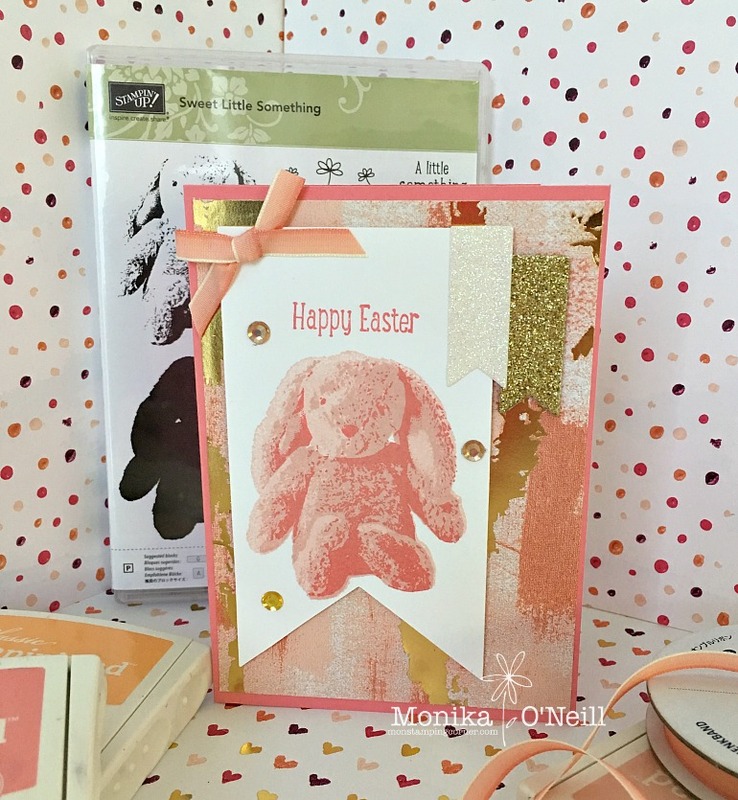 Love your bunny card, Monika and the treat box is fabulous too. I love that framelit - so many options! Fabulous projects Monika - I especially love the window box. Oooh, there's that gorgeous bunny again! It looks so soft in the pink tones. 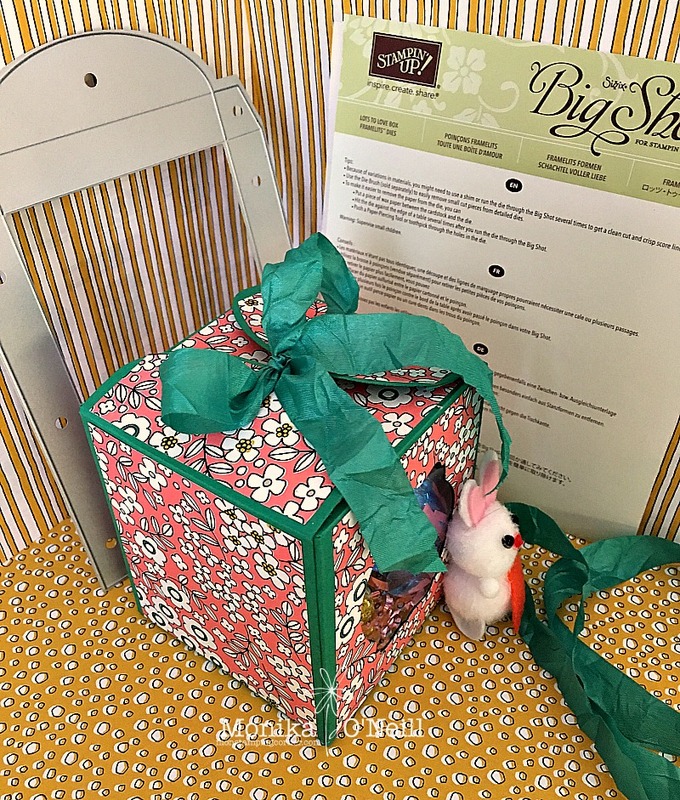 Your box looks great too - a wonderful gift full of choccies! I would never of thought of using that dsp for Easter. Love the card.